I spent quite a while (months/years) looking at almost every messenger bag in existence (and even contemplated designing my own) for my mobile office and for weekly trips to study abstract mathematics at UCLA. I’ve been through dozens of bags (including one that could only charitably have been called a “murse”) and had problems with all of them – particularly shoulder and neck problems from carrying around so much weight. 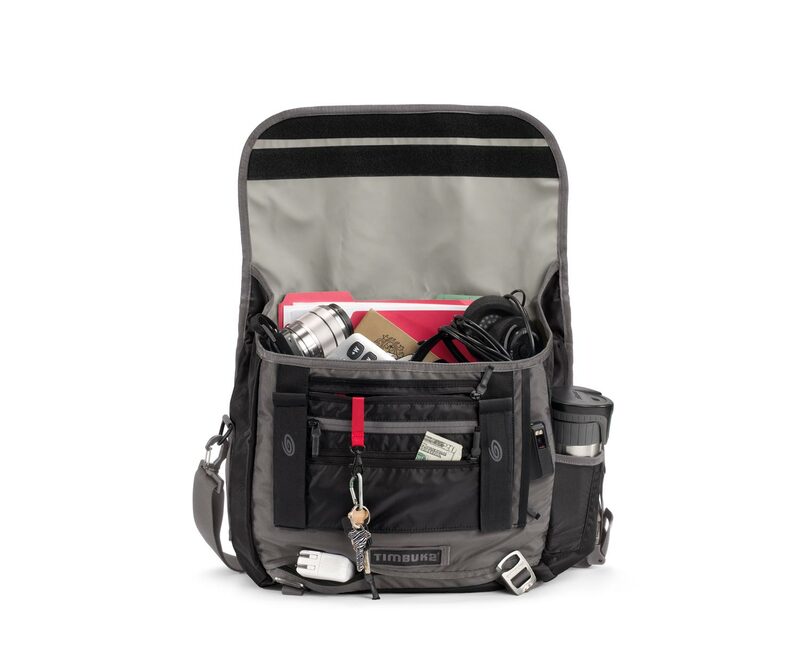 The Timbuk2 Command messenger bag ($139, medium, black) seems to have remedied all of that. My neck and shoulder pains have gone away because this bag is simply so comfortable it feels like I’m carrying half the load that I used to. The two length adjustment mechanisms on the shoulder strap of this bag should be a requirement for every bag on the planet. I simply don’t know how I managed without them for all this time and now I can never go back. One makes it dead simple to take the bag on and off and the other allows for additional easy length change – the combination makes the bag wear incredibly comfortably. As an engineer I can readily appreciate some of the very subtle design and manufacturing elements that truly make this bag a wonder. It’s not only functional and sturdy, but it’s both beautiful inside and out. Timbuk2 has certainly put some serious thought into how to make a bag. In particular the velcro strips at the top of the the flap to keep water out, the Napoleon pocket (so one doesn’t have to completely open the bag to retrieve frequently used items), the plastic strips sewn into the lining to provide additional internal structural support, and an ingenious custom pocket at the bottom of the bag for my cables and computer power brick are simply genius. Although there are quite a number of great and useful pockets, I could do with maybe half a dozen more for daily use to keep either small items (I carry my desk in my bag) or organizing additional papers from floating around inside the bag. One can’t really fault Timbuk2 for this as it’s personal preference on my part and I haven’t seen any other bags on the market with a better designed grouping of pocket spaces for such things. Having a slightly larger water bottle carrier on the outside of the bag would also be excellent, but it’s nearly perfect for my Zojirushi stainless steel thermos and most small (<16 ounce) plastic water bottles. 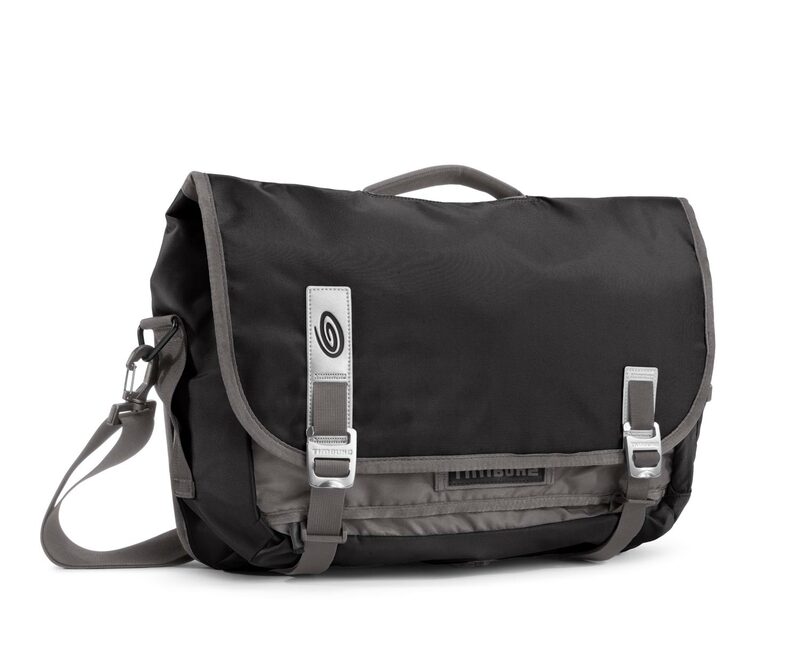 I’ll mention that one of Timbuk2’s line of Classic messenger bags includes internal water bottle pockets for those that desire something like this — or who need full waterproof interiors. The Command bag is roomy enough that I’ve also contemplated using a Camelback-type of fluid reservoir and drinking tube inside for longer day-trips. As a comparison, the next closest high quality bag I’ve seen in my research is Tumi’s Alpha Bravo Benning Deluxe Messenger Bag ($275). It rates incredibly high for design and beauty, but slightly lower on the functionality scale (which still makes it one of the top 0.1% of bags on the market in my mind, so if you’ve got the money, it’s definitely worth it). It’s almost twice the price and though it’s got equivalent design touches and is made from some equivalently excellent materials with fantastic craftsmanship, it is missing some of the more interesting engineering touches including the engineering work on the shoulder strap.